How many cat guardians give their cat priority when they sleep with them? The words with the video below refers to ‘pain’ but I don’t know why. What I do know is that I sympathise with the way the girl or woman in the video slides into bed in a way which does not disturb her cat. When we share our bed with our cat, there might be a certain amount of competition for space and position. 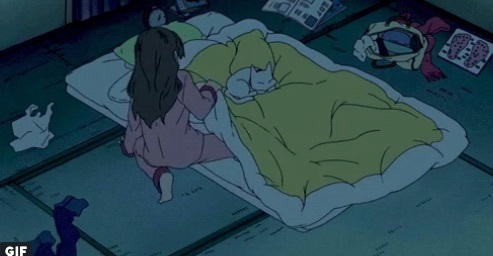 Do you make space for yourself by moving your cat or do you accommodate your cat as best as you can as the girl does in the animated .gif below? Every cat owner shares this pain. I’ll guess and say that most cat guardians do their best to allow their cat to fully enjoy their bed as they want to. The sensitive cat guardian allows their cat to take priority over them. It is purely altruistic behaviour and it can mean the ‘owner’ is uncomfortable for many hours. I don’t have statistics on this. It is impossible to know how many people do this. It should be said that many decent cat owners lock their cat out of their bedroom at night. And they allow a neighbour to feed their cat for two weeks while they are away. I don’t agree with either nor understand it. I totally disagree with locking cats out of the bedroom at night (but respect the views of others). That idea may upset some people reading this. Domestic cats love being on their human companion’s bed or even under the duvet. The whole thing smells delicious to a cat. It is emotional and physical warmth for a domestic cat so why deny them the pleasure? For a good night’s sleep? No I don’t agree with that either. People who sleep with their cat get used to it fairly quickly. We adapt. Cat owners can place a heated cat bed on nearby furniture if they are keen to get their cat off the bed. This should attract their cat. This entry was posted in cat emotions and tagged cat emotions, cat on the bed, cat sleeping on bed, cat welfare, human to cat relationship by Michael Broad. Bookmark the permalink. My mate and I have become contortionists around our daughter. She gets the best of everything as she should. All cat moms and dads know this. I have a 3×4 giant dog mattress elevated on boxes by my bed with a heated blanket on it. Usually I wake up with one on each leg, one under my arm, huggy Frog, and Mercy on my shoulder with her hand on my cheek. Of course our cats have priority. We were both brought up to never disturb the comfy or sleeping puss. It is very rude to do so. The bed feels wrong if there’s no cat in or on it. Getting into bed and sleeping around the cat keeps one flexible, bonus! We have had cats in the past, who would skilfully body surf on us as our bodies turned over during sleep.